You know what time it is! If you don’t, let me tell you: It’s time for Easter Marketing Ideas! Springtime is here! Woot! Woot! So, it’s time for The Shelf's Annual Easter Marketing Contest. Now, no one actually ever enters this contest per se... but we have taken it upon ourselves to pit one firm against the other to see which Easter Marketing ideas tickle our fancies (insert Pillsbury Doughboy giggle here). We scoured the internet for the best, most eye-catching, effective and memorable Easter marketing campaigns. I’m gonna tell you why we love these campaigns, as well as why consumers love them. I’m also gonna share how your brand can take advantage of some of these same principles in order to get more eyes on your brand, and more hands on your products and services. Easter spending always sort of fascinates me, in part because I, like 80 percent of Americans, will be celebrating Easter, and probably contributing my fair share to the more than $18 billion we spend annually celebrating the holiday. Interestingly, those who celebrate Easter will spend, on average, $151 on candies, food, DIY projects, decorations and clothing. But even for those who don’t celebrate Easter, about one in three of them will chip in about 20 bucks into the Easter pot by takingadvantage of the holiday sales. But for the most part, Easter is an American tradition in which the majority of us seem to take part, regardless of age. For most Americans, celebrating Easter is more about tradition than anything else, and it doesn’t really matter who you ask - from Boomers on down to Gen Zers, Easter traditions (think egg hunts and family dinners) are everybody’s favorite part of the holiday. That’s not to say there aren’t other important drivers for the people wanting to get out there and celebrate one of our favorite candy holidays. Fans of Easter between the ages of 18 and 34 enjoy celebrating Easter because it’s a social activity that they share with friends and family. But the 35 to 64 year-old crowd is more impressed by the sales and promotions at their favorite stores. Millennials and older Gen Zers get a kick out of Easter-themed products and decorations. But you aren’t going to impress the 65 and over grandmas with your marshmallow wreaths. You just aren’t. It begs the question, where are shoppers going to do all this retail-y stuff they’re saying they like to do? Discount stores lead the pack with 58.9 percent of celebrants shopping there, followed by department stores (45.8 percent), online stores (28 percent), and local small businesses (24.9 percent) (Yay!!). Okay, so this is throwback knowledge from the first post we did about the resale industry (which you can read here) and how discount stores and off-price stores (think Marshall’s, Ross Stores, TJ Maxx) are gaining favor over department stores and more expensive retailers. Or even whether they’re celebrating Easter! Eighty-nine percent of Easter shoppers buy candy. What do you think of when you think of Easter Sunday? By this time, you probably won’t be clutching your pearls if I say most people plan to spend Easter with friends and family. 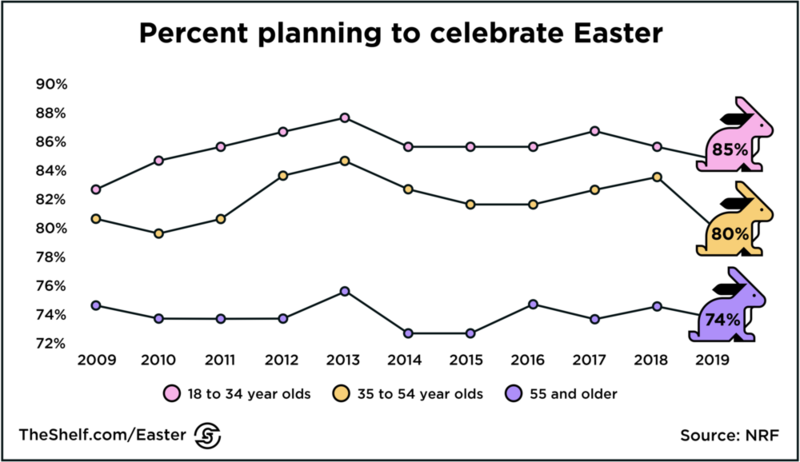 Fifty-seven percent of Easter celebrants plan to cook a holiday meal, while half intend to go to the Easter service at the local church. Three more popular plans for Easter Sunday that don’t seem to be filled with holiday spirit are watching TV, which nearly 45 percent of celebrants intend to do; plan an Easter egg hunt (35 percent); and - get this - browsing the web! A quarter of the people celebrating Easter are going to do so just hanging out on the internet. After searching through thousands of posts, tweets, videos, to find the dopest of them all, we’ve determined that the clear winner is… YOU. And your brand. We did a little double duty by including both the strategies leverage and the tactics being used in the campaigns to make them work. Honestly, some of these aren’t campaigns, but definitely could have been. Easter giveaways are popular. There are more than 12k Instagram posts that include the #eastergiveaway hashtag, and another 1100 or so tagged #eastercontest. Contests are a great way to promote new products and get eyes on your brand, especially if your brand isn’t immediately Easter-related. I mean, no one’s going to forget Peeps because those little marshmallow bunnies are just about everywhere right now. But, a contest is a great way to spread the word about your cookbook. Let’s state the obvious here: People love getting stuff for free, and because most social media contests require people to share the contest with others in order to enter the actual contest, giveaways are a great way to spread the news about your product without having to spend loads of money on social media ads. Cake decorating powerhouse, Cake Angels UK (on Instagram @cakeangelsuk) is on a simple mission: to help consumers make amazingly fabulous creations with their super-tasty, brilliant products. Alix Carey of My Kitchen Drawer (on Instagram @mykitchendrawer) wants nothing more than to offer a special little slice (pun intended) of the internet to other bakers and creative go-getters. Together this pair is responsible for the creation of our all-time favorite Easter holiday giveaway. Carey is a self-proclaimed summer and weekend morning person who says that if you love color, sugar, cake, and baked goods that soothe your soul, then you’ll feel right at home with her, and leave feeling inspired to whip up some deliciousness of your own. Journalist, author, and social influencer in the specialty baking niche, Carey brilliantly paired her latest cookbook with hot seasonal items that Cake Angels had ready to roll out for the spring baking season. Carey told her followers that Cake Angels is synonymous with fun, while promoting her own beautifully-designed cookbook. This all comes together creating the perfect influencer marketing storm of engagement and demand. To enter the contest, contestants had to like the pic, follow both brands on Instagram, and tag a few friends to share the products and contest. As they announced the winner, Cake Angels kept the ‘losers’ wanting more by letting them know that more giveaways were on the way and to keep an eye out for them. While Brooke Haven may, in fact, use the occasional cookie cutter to achieve the desired design of her sweet creations, we affectionately call her the anti-cookie cutter baker because there's nothing common about what she does. Growing up with the nickname Brookie Cookie (on Instagram @brookiescookiesco), she had no idea that as an adult she’d take that name and use it to build a sugary, buttery empire of frosted goodness. The stay-at-home mom of two wants to make her blog the sweetest place on earth for desserts,and she intends to do just that by sharing recipes and tutorials, and embarking on journeys with the goal of finding the tastiest desserts, and having the most fulfilling adventures. As a social influencer, she’s collaborated with Fortune 500 food and beverage companies, and other big brands such as Disney, Bob’s Red Mill, MARS, Sam’s Club, Kroger, LEGO, SeaWorld, Chef Master, Fat Daddio’s and The Original Scrapbox to create, beautiful, fun, informative campaigns. For this particular campaign, Brook worked with Bob's Red Mill, a wholesome foods company. Not exactly a match made in heaven, right - a legacy, low-profile wholesome foods company and an Insta-savvy, fresh and funky cookie company. But it works! Bob’s Red Mill has been a household name for 90 years! Today's consumers watched their grandmothers, mothers, and fathers use this product. As a result they probably believe it’s old school… but a solid product. An influencer campaign like this gives Bob’s Red Mill visibility (and utility) with younger audiences who may be tapping into all the good feels associated with a product Grammy kept in her kitchen. With older products, you have to promote the good and ditch the bad. I mean, this is from the same generation that had doctors telling petite women to take up smoking during pregnancy in order to decrease the birth weight of their babies, and keep them healthier. But, with almost 8500 instances of engagement on this one post (a really solid engagement ratio of about 1.5 percent), the partnership made for a really great brand awareness campaign. I think this is a pretty good campaign to look at for brands that need to reintroduce themselves to the market to connect with younger buyers. The fastest path to relevancy is social proof, and influencer campaigns provide just that. Brook is lovable, trustworthy, and has thousands of people who thrive on what she says. She could be the solution to the credibility issue Bob’s Red Mill may experience courting Millennials. I know that’s probably the most random contest category in the history of random contest categories, but… this pic would have KILLED as a sunglasses campaign. 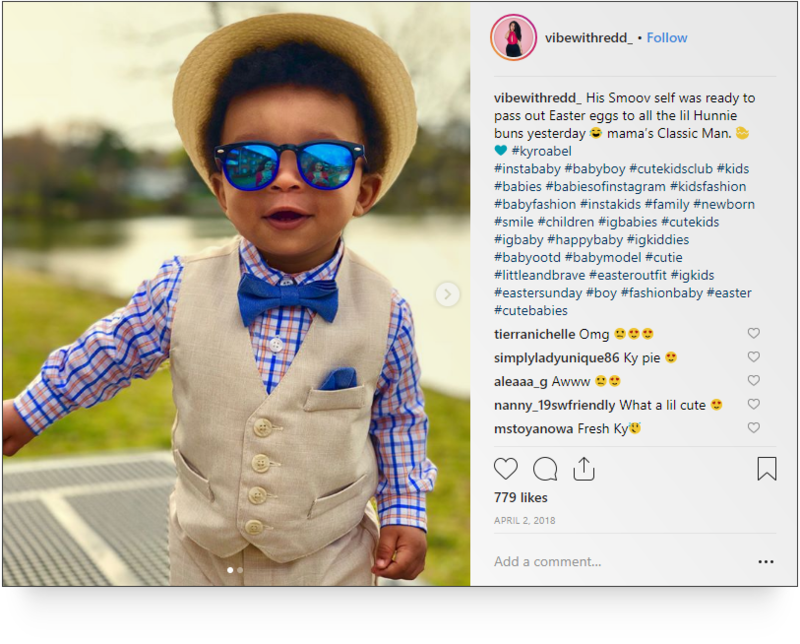 Never mind the fact that little Kyro Abel is boy-slaying in this best holiday bib and tucker (big ups to his mom, Summer Stultz’s (on Instagram @vibewithredd_), there’s science to support why this would have worked as a campaign. With little Kyro Abel rocking the straw fedora 😍, the plaid button-up, the royal blue bow-tie and pocket square... this post would work for mom and pop hat shops, big box retailers, and even holiday photographers trying to fill up their schedules ahead of the holiday. Konrad Lorenz, a zoologist and Nobel Prize winner says that the specific structure of a baby’s face- its large head and forehead, its bulging cheeks, and its low-lying eyes are what trigger our parental, nurturing, and protective instinct. Although, we don’t have a similar reaction to unfamiliar adults, we have the desire to preserve an unfamiliar baby in only one-seventh of a second! The Evian skater babies, the E-Trade baby, the unforgettable CGI dancing baby of the 90s (my mom LOVED that kid from Ally McBeal and would laugh every single time she saw him), and the many other baby-based ads will forever be ingrained in the minds, hearts (and thusly the wallets) of consumers. That’s true if this heat map is any indication of where consumers direct their attention when looking at baby ads. This one’s pretty cool. Look at the purple image on the right there. It showed up in the Pinterest results for the search “Easter decoration”. And THIS purple pictured showed up in the Pinterest results for “easter decor”. Both are promoted posts from Starbust Candy that go to the company’s YouTube channel. Okay. pretty uneventful, right? A little over 27k subscribers… typical-looking videos… Nothing to scream and shout about. Except for one thing - the quiet screams in the header that the Limited Edition, All Pink pack of Starburst is out. PINK STARBURST! MY FAVORITES! Where can I find these? I clicked because I was curious what Starbust was going to tell me about Easter decor. Not that the basket looked all that appetizing, but… it’s Starbust. Click-baity? Sure. But it worked. I’m not offended. And now I know about the annual (I hope it’s annual) tradition of an all pink pack of Starburst. Easter DIY topics are also very popular this time of year, with “Easter basket” and “Easter wreaths” among the top-searched Easter-related terms come springtime. Troom Troom is a popular YouTube channel with more than 1.7 million subscribers and in excess of 3.8 billion video views. What’s cool about Troom Troom is that it specifically targets younger YouTubers with DIY crafts, recipes, hacks, pranks, and home decorating ideas for industrious kids and teens who are into being different, not the same. The channel’s catalog of brightly-colored videos includes Easter-themed content. Interestingly enough, the video embedded below has more than 119k views, 3800 likes, and 290 comments only a day after being posted. So, we referred to this particular strategy as Everybody-In because the video presents lots of opportunities for brands across different verticals to partner with a Creator like Troom Troom. But Troom Troom (or Creators like Troom Troom) is a great option for brands that don’t easily fit into the Easter category (or any holiday for that matter) because this particular channel specializes in presenting creative ideas, activities, and DIY projects for kids. So, the videos are quirky, colorful, and unusual. It’s an expect-the-unexpected sort of channel. This concludes the annual The Shelf Favies awards! We hoped you enjoyed our list and enjoyed our favorites as much as we did. Feeling motivated to make next year’s list? Great! Let’s bang out an influencer marketing strategy for your brand. We can’t wait to work with you, and we can’t wait to see you on next year’s ballot!